Located in a high valley over 800m in the Sierra del Endrinal and dominated by the magnificent rocky outcrop known as Peñon Grande, the pretty mountain village of Grazalema is most popular base for visitors to the Sierra de Grazalema Natural Park. The park is a vast protected area of rugged limestone mountains, which are famous for being the rainiest place in Spain. These high levels of precipitation account for the verdant vegetation in the surrounding countryside. The limestone peaks of 1,500m around Grazalema are the first barriers that clouds from the Atlantic meet, causing plentiful rainfall. A unique microclimate has developed where a wide range of flora flourishes, such as the rare Spanish fir (pinsapo) that grows in the Sierra de Pinar close to Grazalema. Featuring a private swimming pool and BBQ facilities, this superb rural villa is situated in Grazalema Natural Park. Bedrooms feature rustic décor and en-suite bathrooms, and offer spectacular views. 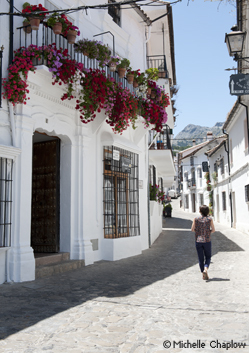 Explore the pretty streets of Grazalema. Grazalema is a lively village whose population of 2,250 swells hugely with the influx of visitors to the park. Its steep, cobbled streets are immaculately kept and are lined by whitewashed houses with windows covered by wrought-iron rejas and plant pots spilling over with colourful flowers. It was famously described in the 1950s by the British anthroplogist Julian Pitt-Rivers in his study, People of the Sierra. In the heart of the village is an attractive main square, the Plaza de España, lined with bars and restaurants. On this square is Grazalema´s central sight, the 18th-century church of La Aurora. Also here is the village hall (ayuntamiento) and the parish church, the Iglesia de la Encarnación. Up Calle Mateos Gago from the square is the 17th-century Iglesia de San José, a former Carmelite convent with paintings by a disciple of Murillo. Close to the church is a viewpoint that looks out over the village. The village was established in Moorish times by Berber settlers who discovered a striking similarity with the mountains of their homeland and those of the Sierra de Grazalema. They introduced sheep to graze the lush mountain pastures and produced wool for ponchos and blankets to guard against the wet climate. In 1485 the Duke of Arcos conquered the Moors in Grazalema but the cottage industry of producing woollen blankets - the renowned mantas de Grazalema - continued, reaching its peak in the 17th and 19th centuries, when wealth from textile manufacturing helped to fund the construction of the village´s churches. A monument to local traditions in Grazalema. Grazalema still has vestiges of this industry today, with one workshop still in operation making woollen blankets, rugs, ponchos and scarves, which are exported all over the world. Visit the Artesanía-Textil de Grazalema, 956 132 008, a workshop on the Ronda road where you can see looms and carding machines and buy blankets and other textiles in the shop. Other locally produced handicrafts include baskets and leatherwork. 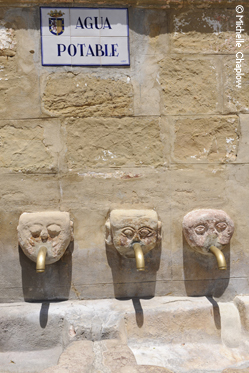 Fresh water to cool off on a hot Grazalema day! If you're here in summer, go for a dip in the town's pool, on the eastern edge of the village by the road to El Bosque, where there are some superb panoramic views over Grazalema and the Sierra. In mid-July, around the Virgen del Carmen fiesta day of 16 July, the village holds its annual fiesta, with flamenco music, fireworks and a procession, culminating in an exciting mini-Pamplona, where a bull is released to charge through the streets. The tourist office (turismo) is on Plaza de España, 956 132 225, and has information on walks (including permits needed for certain routes), the park and local accommodation. It also sells maps and locally produced handicrafts, such as leatherwork, ceramics and blankets, as well as honey, wine and cheese. You can also find out about companies based in Grazalema that offer activities in the park, like rock climbing, mountain biking, pot-holing, horse riding and guided visits. 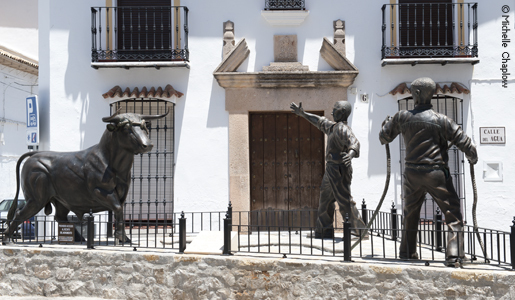 If you want to taste some of the village's best local produce, pay a visit to Sabores de Grazalema, just off the main square, next to the bull statue. The small store is a treasure trove of Spanish hams and other cured meats, along with fruit conserves and chutneys and even honey from the Sierra de Grazalema. 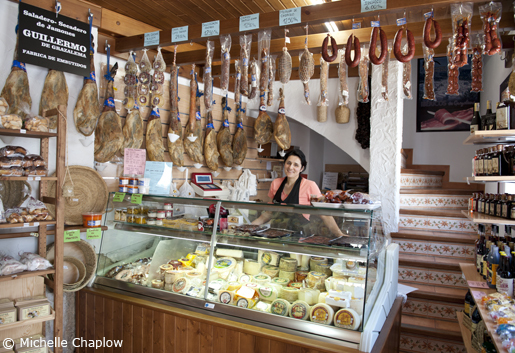 Sabores de Grazalema stocks a wide range of meats and conserves, as well as local honey and baked goods. There are several hotels in the village. On Plaza Pequeña is the four-star Puerta de la Villa, 956 132 376, with a swimming pool, jacuzzi and gym; ask for a room with a mountain view. Opposite on the same square is the two-star Peñon Grande, 956 132 434. North of Grazalema is the Villa Turística, 956 132 136, with wonderful views and a hotel, self-catering cottages, restaurant and a swimming pool. Five kilometres outside the village in cork oak woodland is the largest hotel in the area, the four-star Hotel Fuerte Grazalema, 956 133 000, on the A372 to Ronda at Km 53. 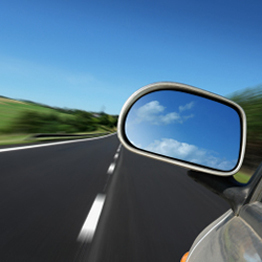 The town´s campsite, Camping Tajo Rodillo, is on the C344 at Km 49 to El Bosque. 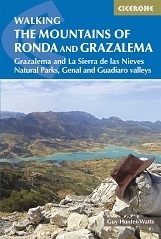 Hover the cursor over Grazalema to see bigger map and click to go to the maps page.